Now you may think what I am about to suggest is strange but I will explain my thinking as we go along. I rarely buy gifts (This is strange to most people). I live a long way from most of my family, postage costs are ridiculous and they all can pretty much afford to buy anything they would want anyway, as can I. Not to mention the fact that I am embarking on this lifestyle change of de-materialising and not bowing to the continual bombardment of the retail industry insisting my life would be so much richer with this product or that. So I pulled the chest out of the closet and started to sort out the gift bows that have already been recycled several time during past Christmases and threw away all the ones that looked like they had been recycled too many time already. This reduced the number enough so that I could empty the chest into a small drawer in the guest bedroom. As we have been selling a number of items on eBay lately and have run out of brown paper to wrap boxes in for mailing I have decided I will turn the gift wrap inside-out and use the white side for wrapping boxes the next time I need to mail something. I have plenty of new and used gift bags I can use for any occasion when I might need them in the future. I transferred my children’s keepsakes into the lovely chest I had emptied therefore eliminating one more box out of the shoe cupboard. As a result of this exercise I have de-cluttered, recycled, re-designated (I love to live outside the box) and reshuffled creating a little more space. I would just like you to know that my family and friends understand that gift buying is not necessary to a loving relationship. My family would prefer I spent my money on the travel to come and visit them and my friends would rather enjoy a day together going to the movies, having a meal together or something of that nature. I am not a complete scrouge. Oh! By the way, I am going to a wedding this weekend and the couple, who have been living together for a few years, have the good sense to have a “Wishing Well” so people give money as the gift and they don’t end up with a house full of unneeded clutter. 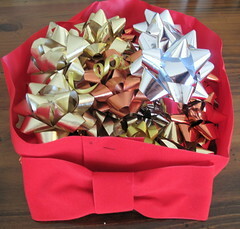 These are the bows that found their way to the garbage today. Nice to know I’m not the only one adverse to gift giving for the same reasons you mentioned. I enjoy your blog. I, too, am on a 365 Day Clutter Challenge starting last Nov. 9. It’s been fun but I’m not photographing my items – just keeping a list of them. It’s been a fun game. My friend asked me today what am I going to do when I run out of stuff to get rid of. Ask me in November. I hope you make it all the way to November with your 365 day quest and if you don’t then you have probably done all you need to do. Do you find that you no longer want to buy stuff because your mind is set on decluttering? And do you find you are getting more ruthless about what you throw away as you go along? Good Luck! In our family we are oceans apart (literally!). Therefore, we just give a donation to a charity in the family name. We all do it. Then we don’t have to worry about anything to do with the commercialism of any holiday where gifts are ‘supposed’ to be appropriate! It took us a while to get everyone on board with this process, but now we would not have it anyother way! Our holidays and etc are MUCH SIMPLER and HAPPIER! that is fabulous. That approach would make every occasion happy in my book. I had got to the point where I dreaded Christmas not because I couldn’t afford it but for the commercialism, the waste and the difficulty of not knowing what to buy. The whole pointlessness of it used to drive me mad not to mention the fact that it had turned from a Holy Celebration to a materialistic free for all. People going into credit card debt to buy gifts they could not afford. Oh, I could go on forever and I know I sound very bah humbug but with the new arrangement in our family I am actually looking forward to Christmas this year. So good for you for dematerialising and simplifying your special occasions! I disagree with the idea of no gifts. At one point my Christmas gift list had 42 names; the mailman, pastor, siblings and families, teachers of our children, all Aunts and Uncles, gift exchanges and anyone who touched my life throughout the year. I shop year round and although most of these folks have passed on, I’ll never forget the look of joy on their faces to know they had been remembered. Most of the time it was something they would use (ie lip balm, note cards with a book of stamps, purse size hand cream….) I never expected anything in return. My gift is in the heartfelt joy of giving. We are all very different, one no better than the other. Just wanted to share a thought on this subject.